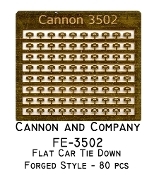 This accurately rendered Plate C Box Car End is available for the first time as a detail part. This accurately rendered Bifurcated Box Car End is available for the first time as a detail part. 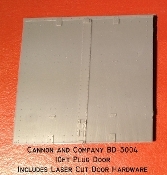 This injection molded door is designed for modifying a Red Caboose PFE R-70-15 Reefer into a R-70-13. This Injection Molded 10 ft Youngstown plug door, includes Laser Cut door hardware. This door in included in FC-4001. One Pair. Direct Order Only. Athearn Genesis Underframe from PC&F RBL. Includes brake hardware & Hydra-Cushion. Length modified to fit our kits. Athearn Genesis PC&F RBL Side and End Ladder Sprue G43003. Accurail #107 50ft Non Overhanging Diagonal Panel Roof. Accurail #120, 50 Ft Floor/Underframe with Details. Atlas/Branchline BL-100002 R 3/4 Improved Dreadnaught End . With Details and End Ladders. Atlas/Branchline BL-100016 Side Ladder Set. Includes Stirrups, Tack Boards and Side Grabs. Moloco RF-0801 50ft Overhanging Diagonal Panel Roof. Moloco PC&F Cushion Draft Gear DG-0412. Includes Air Hoses & Screws. 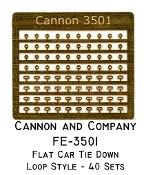 Photo Etched Brass Flat Car Tie Downs. Forged Style 80 Pieces.